The Super Weirdo from JPTR FX is truly a one-of-a-kind pedal. 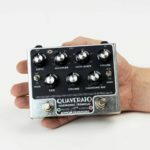 JPTR FX calls this pedal a “Glitch Super Fuzz Time Modulation Unit”, and that barely scratches the surface of what this awesome guitar pedal is all about. 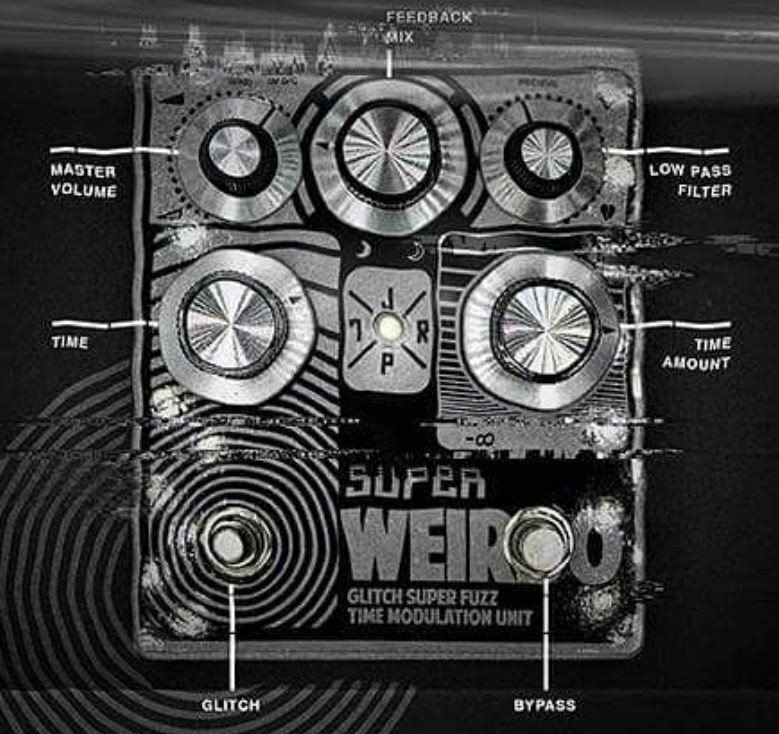 With the huge knobs on the front of the pedal, and the massive metal enclosure – the Super Weirdo is an amazing looking pedal straight out of the box. Chris (The man behind JPTR FX) was also nice enough to include a ton of JPTR FX stickers with the package. What is the Super Weirdo? 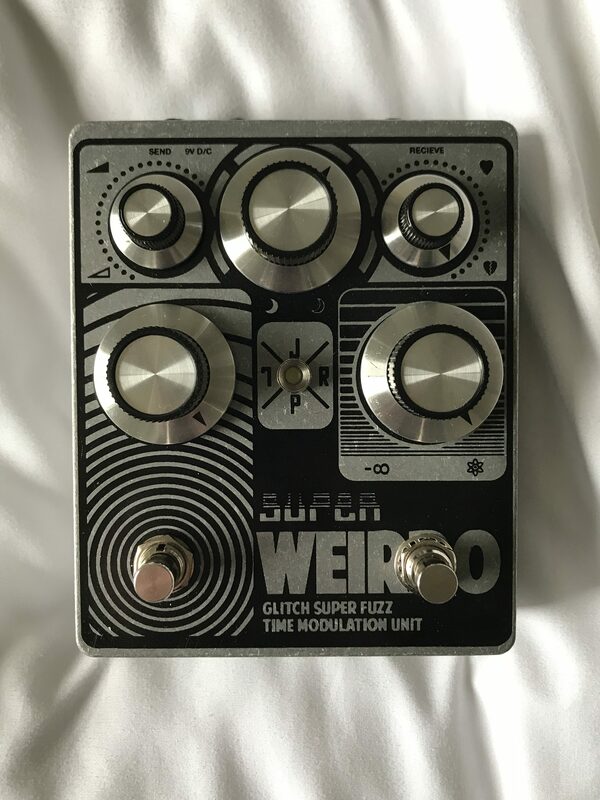 The Super Weirdo pedal is a full blown Fuzz that is capable of achieving some incredibly thick and heavy fuzzed-out tones from the moment you switch it on. There is no gain control knob for the fuzz, so there is no calming this beast once it is unleashed – This pedal is a doom machine. Don’t let the lack of a gain knob fool you though. The volume and tone knobs will help you dial in a tone that works for you. 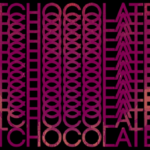 With that being said, the Super Weirdo has a secret weapon – they modulated delay feature. The Super Weirdo get super weird when you start playing with the time modulation side of the pedal. As the “time” and “modulation” knobs are adjusted, a whole new pedal is born. 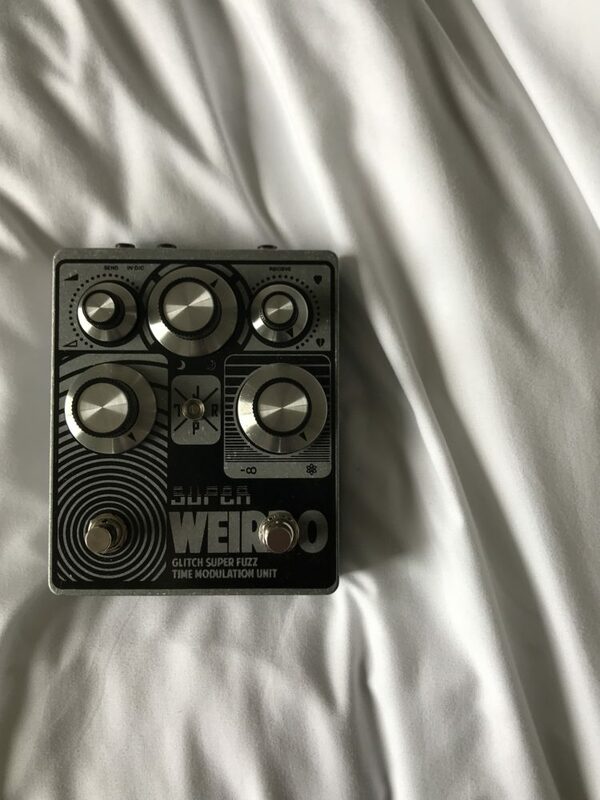 The modulated delay side of the Super Weirdo acts almost as some sort of doubletracking slap back delay, which can be controlled by the Time knob of the pedal. These settings allow the pedal to go from a straight up fuzz unit to an insane space-time-bending machine. The upper left knob is the volume knob of the Super Weirdo. The upper middle knob is the “feedback” control. This knob allows you to dial the amount of feedback that you want when you press the monetary Feedback footswitch. The upper right knob acts as a tone control for the Fuzz. 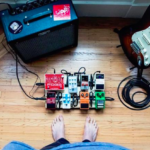 Since there is no “gain” control for the fuzz, adjusting the volume and tone knobs can help dial in some amazing fuzz tones. The lower left knob controls the time of the pedal’s delay function. As you turn this knob up, the delay continues to get faster until it is seemingly nonexistent. This knob can also be adjusted remotely using an external expression pedal! The lower right knob controls the amount of modulation within the delay. The left-hand foot switch of the Super Weirdo is the “Feedback” button. Stepping on this causes the pedal freeze on whatever note you are playing, and repeat it back at different speeds (depending on the setting of the “Time” knob). 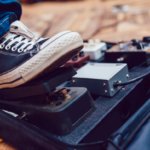 Depending on how you have your “Time” and “Modulation” knobs set, this can really cause the pedal to freak out – and it rocks. 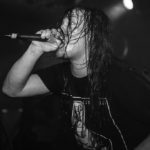 If you are into creating walls of sound, or crazy noise, then this feature is a selling point for the Super Weirdo! This pedal is definitely weird, but the standalone Fuzz side of the pedal is truly an incredible sounding fuzz and should be considered as a fuzz pedal if you’re looking for a heavy, sludge type fuzz. For the price point – this is a great option to add to your collection. I would not say that the JPTR FX Super Weirdo is the perfect pedal for everybody, but it can be an incredible pedal for those of you who are into sound scaping and want a truly weird pedal in your setup. I think it is impossible to understand exactly what is happening inside of the Super Weirdo, however JPTR FX has found a very unique way to combine fuzz, delay, and modulation all in one box – at a great price. With nearly endless possibilities and uses, the Super Weirdo is really a “try it for yourself” type of pedal. Be sure to check out JPTR FX’s website, and follow them on Instagram!